Fibre Content is a biennial juried exhibition held at the Art Gallery of Burlington (Ontario). The call for entries opened on March 1 and closes on May 31, 2018. So there is still time to enter! 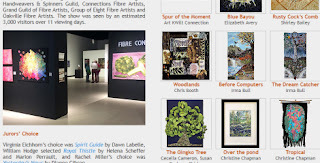 Go to the Fibrations website to get the entry form, information about Fibre Content 2018 and galleries of the previous exhibitions. The Viewer's Choice second place runner up in Fibre Content 2016 was Tracey Lawko, for her piece, Spring Thaw. Tracey is a long-time member of the Toronto Guild of Stitchery. Check Tracey's website, you'll find an engaging article where Tracey shares her process. This year, the show will be held from September 6 to 16, 2018. Get all of the show details - there will be artist talks and hands-on events.